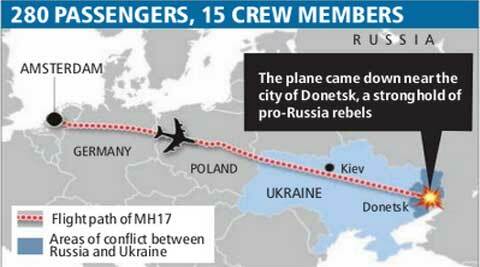 A Malaysia Airlines Boeing 777 with 295 people aboard crashed in eastern Ukraine near the Russian border. 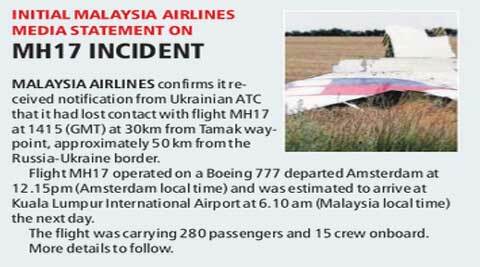 MH17 CRASH: A Malaysia Airlines Boeing 777 — Flight MH17 en route from Amsterdam to Kuala Lumpur — with 295 people aboard crashed in eastern Ukraine near the Russian border on Thursday. Ukrainian officials said it was shot down by pro-Russia militants, possibly with a heavy, Soviet-era ground-to-air missile. ‘DON’T PANIC’: After strewing debris over an area of several miles, Malaysia Airlines Flight MH17 came to a rest in a large wheat field dotted with purple flowers and ringed in Queen Anne’s lace. Incongruously, many of the bodies strewn about in the smouldering wreckage were largely intact, indicating that the plane had made at least a somewhat controlled landing. 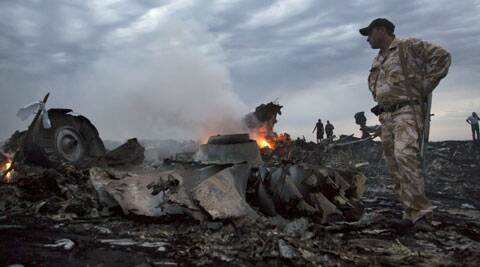 US RESPONSE: President Barack Obama directed U.S. officials on Thursday to do all they could to support an investigation into what caused a Malaysian jetliner to crash in a Ukraine war zone and pledged support to the affected countries as the probe moves forward. 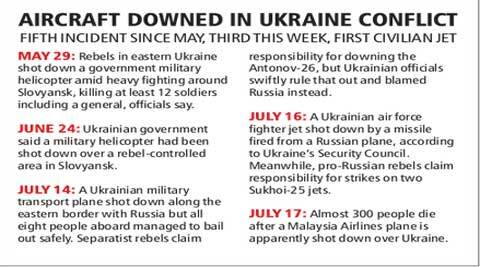 UKRAINE’S DENIAL: Ukraine’s president says his country’s armed forces did not shoot at any airborne targets, after reports that a Malaysian Airlines plane went down over Ukraine. Powerful: The BUK surface-to-air missile system (like this one), that is believed to have shot down flight MH17, is an old Soviet-built weapon designed to engage light aircraft, cruise missiles and drones. MH TRAGEDY: Two Boeing 777s. Two incredibly rare aviation disasters. And one airline. In what appears to be a mind-boggling coincidence, Malaysia is reeling from the second tragedy to hit its national airline in less than five months. RUSSIA’S OFFER: Russia asked Kiev on Thursday for permission to help with rescue work in eastern Ukraine after a Malaysian passenger airliner was brought down there, the Emergencies Ministry said.